In this post we are going to explore some JMS transport capabilities in WSO2 ESB. 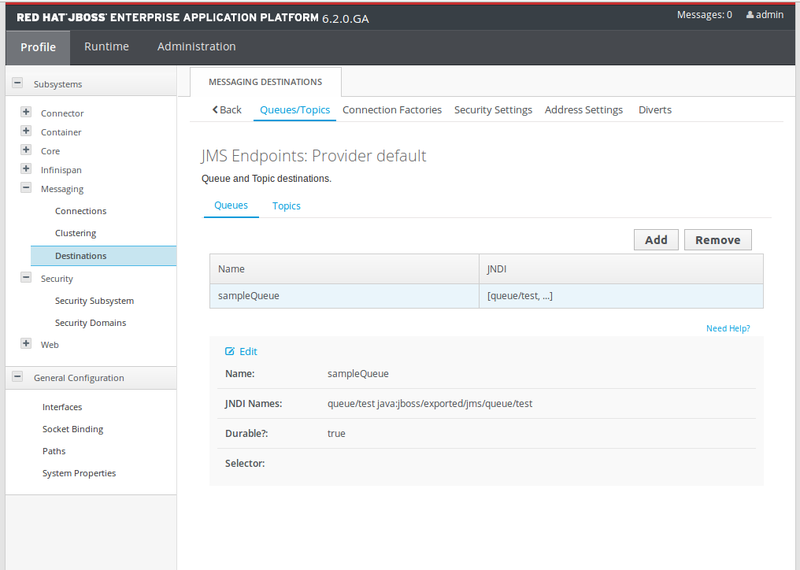 We are going to learn on how to create a message queues in JBOSS EAP, Publish sample messages to that queue. And finally using WSO2 ESB to listen to that queue and fetch the messages from the queue. Following are the per-requisites for this tutorial. 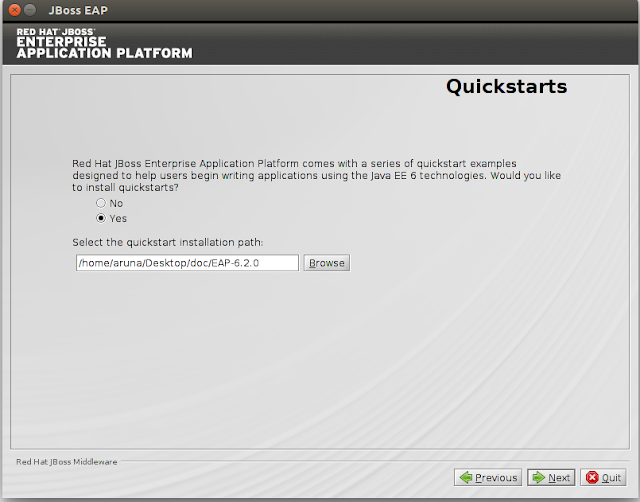 First lets install the JBOSS EAP to your local machine. Follow the below instructions to install. 1. Start the installer using the following command. 2. Continue the installer with appropriate values (mostly default configurations). Select yes to install samples. Since we are using the helloworld-jms sample to publish messages to the queue. Otherwise you can write your own sample client to publish messages. 3. After that fill out the details with default values as it is, and finish the installation. 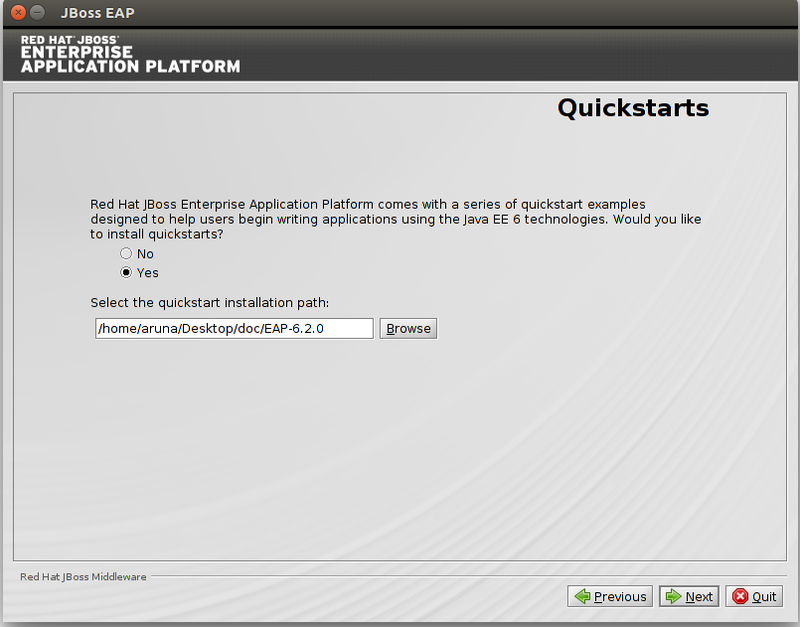 Now you have installed JBoss EAP successfully, Now lets create a new application user and a new message queue. Adding a new application user. Move to the JBOSS-EAP installation folder and execute the following command. You can add a message queue directly editing the EAP_HOME/standalone/configuration/standalone-full.xml configuration file. Follow the below steps to add the new message queue. 2. Add the following content inside the <hornetq-server> element. Now Start the JBoss server with following command and login to the management console. After logging navigate to Profile -> Messaging -> Destinations. And you'll be able to see the added sampleQueue. And if you move to Security Settings section in the same page, you'll able to see the Role with guest has the permission to consume and produce messages to the queue. Now the configuration part of the JBOSS EAP is done. Lets configure the WSO2 ESB. In this sample we are going to consume messages from the queue. So we are going to configure only the JMS Transport Receiving part in the ESB side. 1. Open up the WSO2-ESB/repository/conf/axis2/axis2.xml file and add the following configuration. For the username and password add the user details we have created in JBOSS side for both transport.jms and java.naming.security parameters. 2. Copy the jboss-client.jar to WSO2-ESB/repository/components/lib folder. 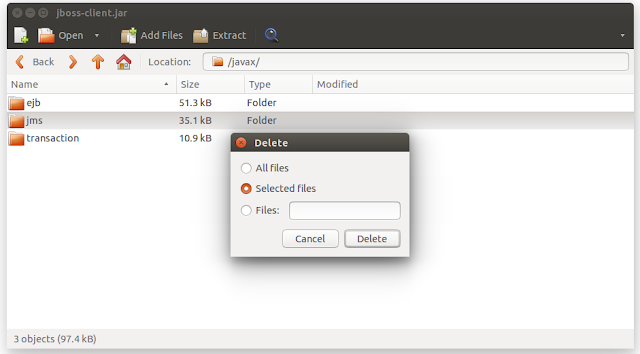 IMPORTANT After copying we have to remove the javax.jms package inside the javax. Now Start the esb server by executing the ./ESB-HOME/bin/wso2server.sh command. Login to the ESB Management console and create the following sample Proxy. If the deployment of the proxy is successful you'll see something similar to the following log. [2016-01-13 12:47:33,712]  INFO - JMSListener Connection attempt: 1 for JMS Provider for service: JBossToESB was successful! To test this JBOSS ESB integration is working we are going to use the helloworld-jms sample client which comes with the JBoss installation. Navigate to the following folder EAP-Home/jboss-eap-6.2.0.GA-quickstarts/helloworld-jms. Then comment out the following code block from the src/main/java/org/jboss/as/quickstarts/jms/HelloWorldJMSClient.java file. Since we don't need the consume part of the sample. ESB will consume the message. Execute the following command to run the sample. mvn clean compile exec:java -Dusername=SampleUser -Dpassword=SamplePwd1! -Dmessage.content="Hellow WSO2 ESB From JBoss EAP"
If the above command fails to execute due to dependency issue. You may have to add following profile to Maven-Home/conf/settings.xml. Or else you can add the above repository to the sample's pom.xml. helloworld-jms sample client will add a sample message to the sampleQueue after running the above command. And now if you check the ESB Console, You'll see something similar to the following log, proving that the ESB has consumed the message from the JBoss JMS queue. Possible Issues and How to troubleshoot them. 1. Address already in use when starting ESB Server. Check the java.naming.provider.url is correct in the axis2.xml transportReceiver Parameters. 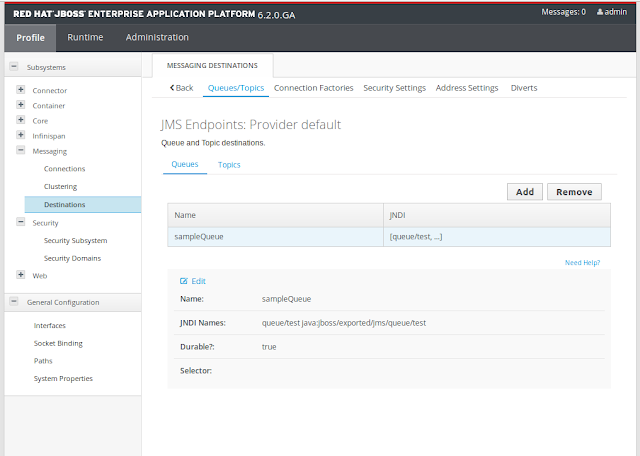 Check the JBOSS EAP is up and running and reachable to WSO2 ESB.